Invitations are the first visual your guests have of your wedding day, and as a graphic designer specializing in stationery, I’m so excited to break the process down for you today! Your invitations set the tone for the feel of your event, and they determine more than we realize. For example, casual invitations mean casual dress code. No link to the registry means no wedding gifts. Lots of assumptions are made based on the effort put into this first step, so it is important to establish what you are hoping for from your big day before selecting your invitations. Should you choose to hire a stationery vendor, this effort is equally as important. Take the time to research the designers and invitation styles you are drawn to; it is so easy to get caught up in the hustle and bustle of planning, but slow it down for the fun stuff, like selecting your stationery, and of course, sampling the wedding cakes (also see What to Think About When Hiring a Dessert Vendor). The planning process is overwhelming, but it is all worth it in the end! Not many people have experience hiring a custom stationery provider before wedding planning, so it is hard to know what to expect. For maximum efficiency and beautiful end products, your stationery vendor should be treated as you would any other vendor for your big day. This means phone calls, mood boards, lengthy email chains and timelines! It is crucial that everyone is on the same page about how long the process will take—some vendors have a quick turnaround time, especially if there are no handmade details. If you’re going the letterpress, custom shapes and sizes, belly bands, envelope addressing route, expect there to be a labor expense, both in finances and in time. Save the dates can go out as soon as you have announced your engagement to get the word out, and invitations should go out around 2 months before your wedding—any earlier and people may forget, and any later, you will be scrambling for last-minute RSVPs! Make sure to include this in your initial contact with your designer with these deadlines in mind. These days, there are so many awesome online stationery stores readily available to all brides and grooms. Invitations have come a long way! Websites like Vistaprint and Minted can produce beautiful suites at a fraction of the cost of a small business (in my case, just me and my very supportive and wonderful favorite coworker, my fiancé!). These stores have a quick turnaround time, great customer service and beautiful pre-designed suites to choose from, but if creative control is what you want and you already have a specific vision in mind, you will lose the personal touch of creating something completely yours. With a custom designer, you can design each and every detail as a team to produce the end result of your dreams, however, the process is longer than you would think. Some stationery providers print in-house, some outsource printing. For me, I do a bit of both—I hire out the actual invitation prints, but I do the special touches at home. Belly bands, envelope addressing, rounded corners, table numbers and name cards are all done in-house, then shipped from my home to the beautiful couple. In some cases, I have couples with a tight turnaround time, so we nix any special touches and I can ship directly to them, not too different from Minted or Zazzle or Vistaprint. Many designers, myself included, offer semi-custom suites for this very reason, and they are often at a more affordable rate because it’s less work for everyone involved. Just shop that designer’s website or portfolio, choose the one you are most drawn to, plug in your wedding information, and voilà! Textiles | Tono & co. This is a tricky one because not many custom stationery providers advertise their pricing, however, doing your research on the average price of the style of paper you are interested in will give you a solid understanding of if that vendor aligns with you. Screen printed or digitally printed designs will typically be at a lower price point than embossed or letterpressed designs, and additional services such as envelope addressing, wax seals, belly bands, etc. will be at an added price. Have a secure idea of your budget for your invitations, because things like additional services can add up quickly. Including your budget in the initial email or phone call to a vendor will give them an idea of if you are a good fit for them, and vice versa. #4 Moodboards, Buzz Words, Inspiration! As I mentioned previously, treating your stationery vendor as you would any other vendor streamlines the process immensely. The details you envision for your big day will inspire the style of your invitations, so spare no detail! Many brides and grooms have a Pinterest board or a folder on their phone they share with vendors which makes sure everyone is on the same page. Tip: create a mood board or even a list of three or four words you want your wedding to reflect, and share it with your vendor as soon as you contact them. They will be so happy that you have given them an idea of your style and goals so early on. Along with this, I’ll touch on the awkward but necessary topic of design: plagiarism vs. inspiration. Pinterest has been a major game changer for weddings; couples have a huge platform dedicated to helping them find inspiration for their big day, and certain wedding inspiration images have gone viral over the last few years. There is one particular image that I am frequently emailed about, asking if I can recreate that design for a lesser price than it’s being sold at on Etsy. This is not allowed. That designer spent time creating that beautiful suite and pricing it accordingly, and it is inappropriate to ask another designer to mimic someone else’s work. There is nothing wrong with being inspired by that image though, so make sure to note what it is that you love about that particular image and your designer should be able to give you your unique suite. After all, it is your wedding! You have spent so much time curating the perfect day, so your invitations should be as unique as you are. Creating a custom suite with a designer takes time and effort that not every bride or groom has. But it is also a once in a lifetime experience with long-term payoffs. Custom signage for the big day, party favors, bridal shower games, thank you cards, monograms, the sky is the limit! You have now created a brand for you and your partner that you can reuse for holiday cards, home decor, etc. You are also in the hands of a professional who can direct and assist you with any questions you have. Being able to create exactly what you have in mind for the biggest day of your life is priceless, and trust me, your guests will appreciate the lengths you went to! 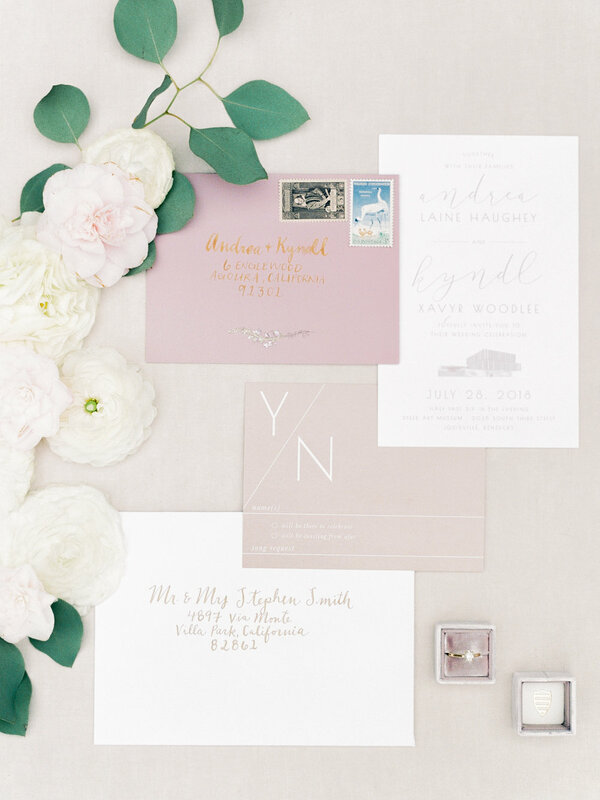 Snail mail is becoming a thing of the past, so send your guests something intimate and beautiful. Everyone appreciates a personal touch—it is becoming a lost art form. I hope this answered any questions you have for a stationery vendor! Each process will be totally different depending on the designer you work with, but having these five aspects in mind will get you in the right mindset. In my opinion, taking the time to create a unique suite for you and your partner is totally worth the extra planning, and many couples truly appreciate the creative aspect of making something their own. Whether you decide to go with a simple RSVP card and invitation or a 9-piece letterpress suite, hiring a small business owner who can make your vision come to life is an invaluable experience. Author Bio: Hi! 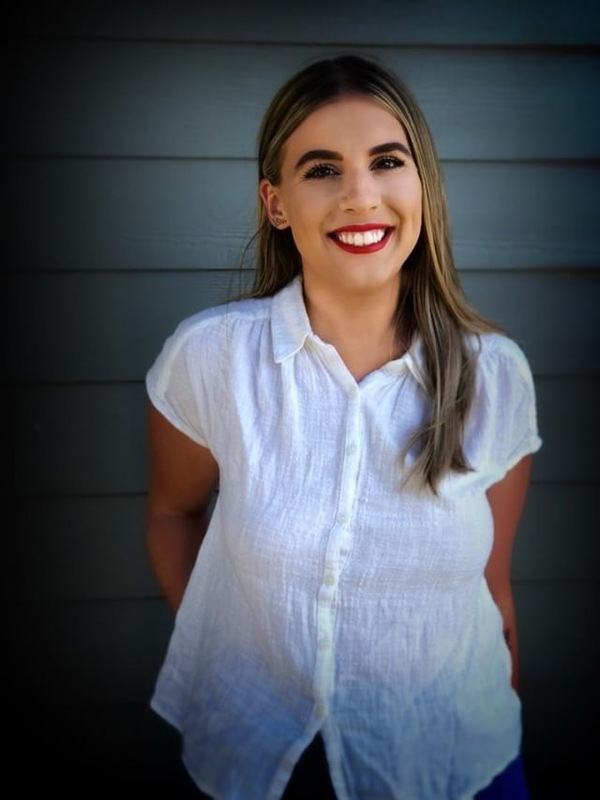 I’m Andrea, a 24-year-old graphic designer and printmaker in Eugene, Oregon making my way into wedding world with custom and semi-custom suites for couples across the country. My style is eclectic and whimsical with a classic flair, and it is constantly evolving as I grow as a freelancer. I am taking the next month off to focus on my own wedding, but stay tuned for Andrea Woodlee Design coming in August 2018!